Heading out for Saturday brunch with friends at your favorite neighborhood spot? Better bring Heather Lodinsky’s comfy hoodie in case the weather turns chilly. Tahki’s Donegal Tweed wool singles yarn delivers beautiful cable structure and insulation from the cold. Now offered in extended sizes. 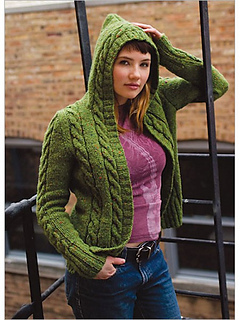 See the CPH Plus Size Galleries on Knitting Daily! Finished Size: Sizes 32 (36, 40, 44, 48, 52, 56, 60)“ bust. Yarn: Tahki Donegal Tweed (100% wool; 183 yd (167 m)/110 g): #803 yellow-green OR #869 dark-taupe (brown): 6 (7, 8, 9, 10, 16, 18, 20) skeins. Gauge: 17 sts and 24 rows = 4” in St st on larger needles.